We had a plan of how we wanted the home to work electrically with switches, plugs and lights but we relied on Vernon Cheek's vast knowledge and experience of the home electrical system to see it through. We gave Vernon and his team complete and utter control to avoid any pitfalls in the future with too many customer whims. 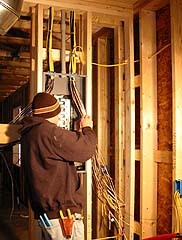 All electrical, audio/video (a/v) and network wiring was run where rafters connect and they form an open chase. 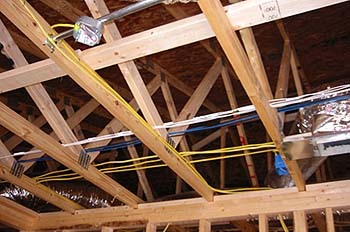 This allows for locating of wires after 16" of blown-in cellulose is added to the attic. Network, a/v, telephone and security must be installed in a way to ensure they don't interfere with other electrical cables in either an open or closed chase. 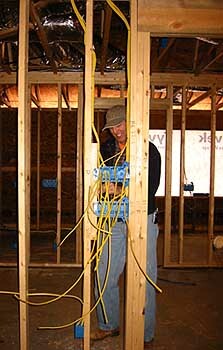 Although Vernon Cheek is experienced and capable of doing all home communication wiring, we chose to do our own telephone, networking, home entertainment, audio/video and home security system wiring. Using only industry acceptable materials for each application, even if the cost is a little higher initially. For example, many companies will use Cat-5 at 5¢ per foot vs. audio cable at 85¢. Cat-5 is not sufficient to give proper sound and performance from the home entertainment system. This is why companies with the lowest quote are not always best - it depends on material quality and installation. 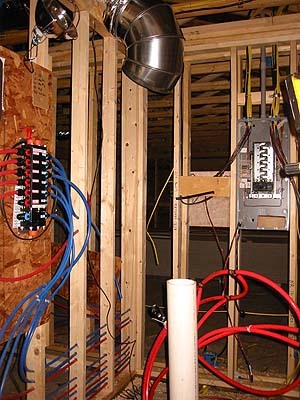 From left to right - network wiring box (bearly in view) and plumbing manifold system (on OSB board) connecting to plumbing pipes through walls; HVAC supply (the returns from each room will culminate here also and one filter can be easily changed); the electrical panel and in the center of the room, the radiant floor heat tubes and chase (white tube) for bringing in water. Network, telephone, A/V, security - Harrelson's Home Improvement Company.